These photos were taken on April 18, 2015 at 7:58 AM. The location was in Rosslyn, Virginia on a main street. The "Take it!" was made available through having the luxury of being a passenger at a time when ordinarily, I would be driving and thus be focusing in on the next intersection, rather than the peripheral views available as we made our way in this down town setting. Fortunately, we made the drive past this momentary marvel and somehow it caught my eye. I was not fully able to comprehend what I was looking at but knew it had to be looked at again, thus arranged for us to circle the block after we had completed our task at a nearby location. 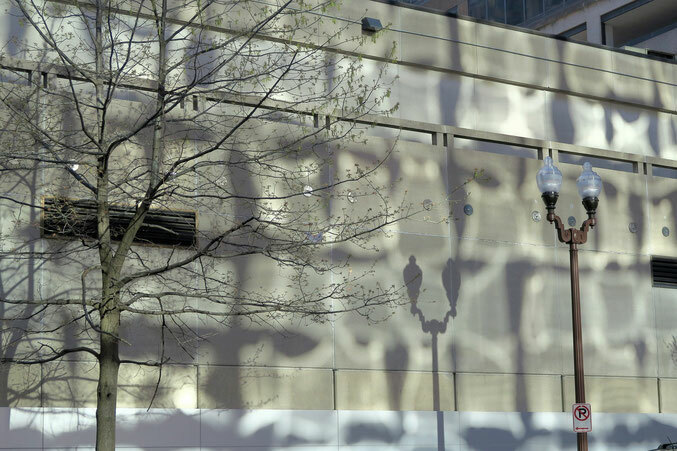 The return revealed this amazing reflection from the morning sun off the mirrored glass surface of a nearby high rise. 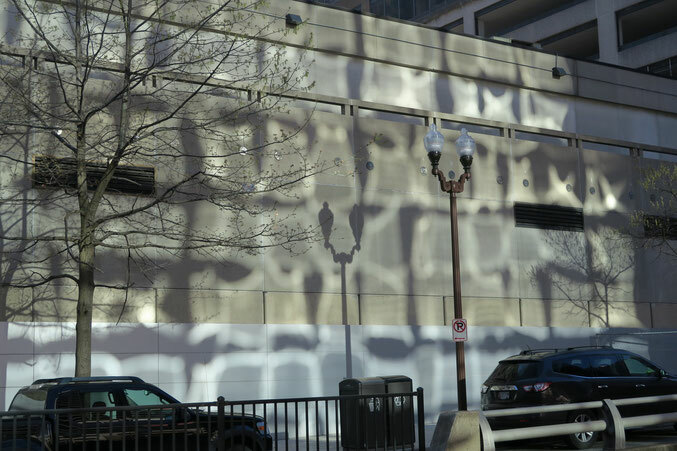 The reflection was slightly distorted, thus giving the recipient wall a sort of water like influence, much like one can see at an aquarium or a wall next to a swimming pool when there is light cast upon the surface. I took the opportunity to shoot this scene several times, with just a few steps and alterations in photo lengths for a variety of impressions. Since I was shooting from one side of the street to the other, I took the liberty later, to crop out some of the street level distraction, which came in the form of parked cars and guard railings as the street actually has in its center, a few lanes that are the start of an underpass. Each view has its own effect. The After Take: Everyone seemed to enjoy this set immensely. Once again, the providing of the above explanation seemed to deepen the appreciation for what was being viewed. I always make certain to express my gratitude for being able to see some of these things. In this instance, like many others, it was the good fortune to be passing through this setting when the sky was clear enough to allow the sun to bounce off the nearby building at just the right time of day, to bring us this wonderful effect. Thanks for taking a moment to join in the wonder of it all. That is pretty neat looking. I have not read your thoughts on the photo yet, but I imagine it will answer some of my wonderings about it. Funny my first thought was that it could be a maze made of light. These two photo's are out of this world. What a great catch, cool that you thought to do a loop and take a picture of this beauty. I agree with living4love it looks like a maze to me. What a spectacular picture. Seeing that one in person must be a real treat. Oh my, there is just so much here to look at. My coworker, Mrs. Hampy, said this week had a great photograph. She wasn't lying!